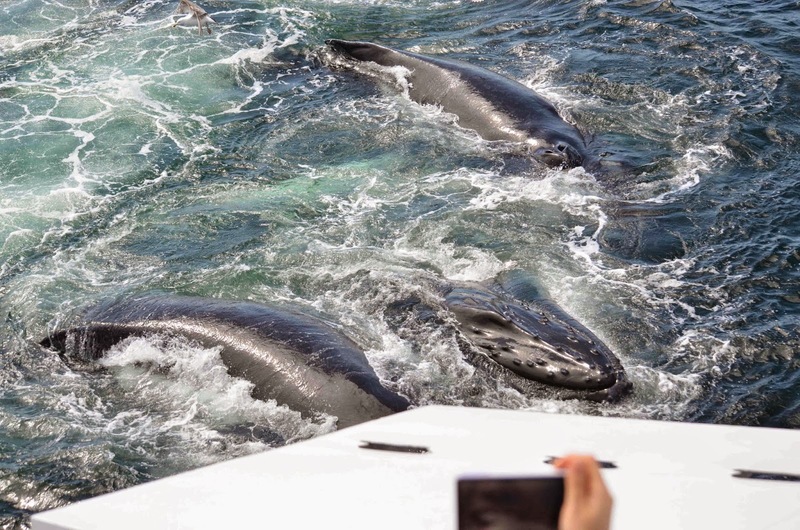 On the 1:30 trip on board the Aurora we left Boston to find that the seas had calmed down a little since the morning trip and we were able to make out trip out to Stellwagen to once again see amazing feeding humpback whales. 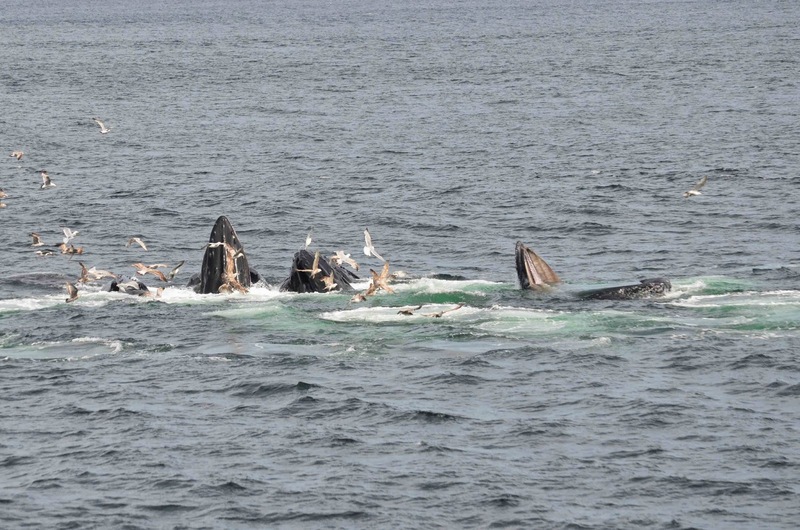 In total we were able to identify 14 humpback whales today including three mother and calf pairs! We started out with a group of three: Geometry, Daffodil, and Osprey who were bubble feeding and making huge rings of bubble blasts! This group seemed to be moving towards a very large group of whales so we were lucky to find ourselves between both groups of bubble feeding animals! This large group consisted of Orbit, Cajun, Yoo-hoo, Dome, Tongs and calf, and Milkweed and calf. 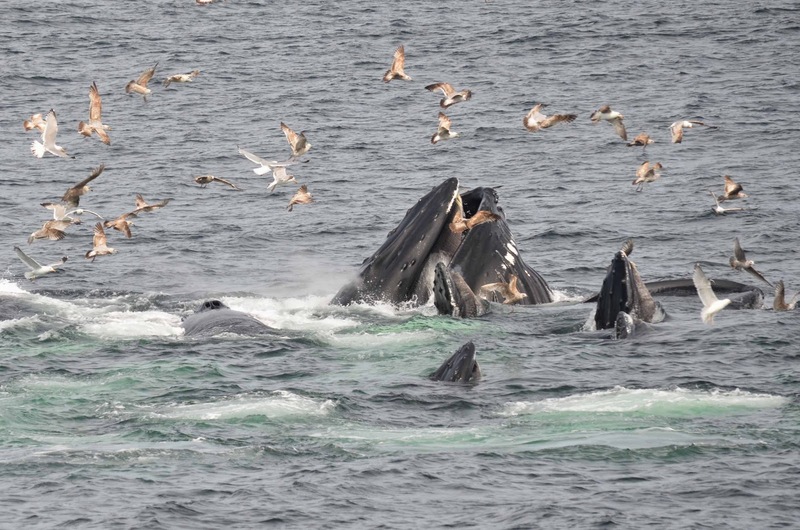 It was amazing to see so many animals feeding together like this, the coordination under the water must be some to behold! We stayed the majority of the trip between these two groups and got great views of the animals, especially we they made a few close approaches to the boat. The most exciting moment of the trip was likely our group of Osprey, Geometry, and Daffodil feeding practically below our bow pulpit! As the bubble clouds rose to the surface I could actually see the sand lance swirling around! We also had a quick pass by of Grackle with Wizard and her calf! It is wonderful to see the evidence of, or in the case today, the actual fish that this feeding behavior is all based around. I hope everyone else enjoyed the trip as much as me!